“MRP Realty, developers of commercial, residential, and mixed-use real estate across the Mid-Atlantic region, and FRP Development Corp, Inc., a full-service real estate company, today announce the formation of a joint venture to develop Phase I of Bryant Street, a mixed-use development in Northeast Washington, DC. This first phase will feature three mid-rise buildings with 490 multifamily units, a nine-screen Alamo Drafthouse Cinema, and an additional 40,390 square feet of ground floor retail. The first phase of Bryant Street will include significant public realm improvements including a plaza, a new urban grid, a dog park, a market building, ample outdoor seating for the public, and an improved Metropolitan Branch Trail including Metro pedestrian access adjacent to the site. 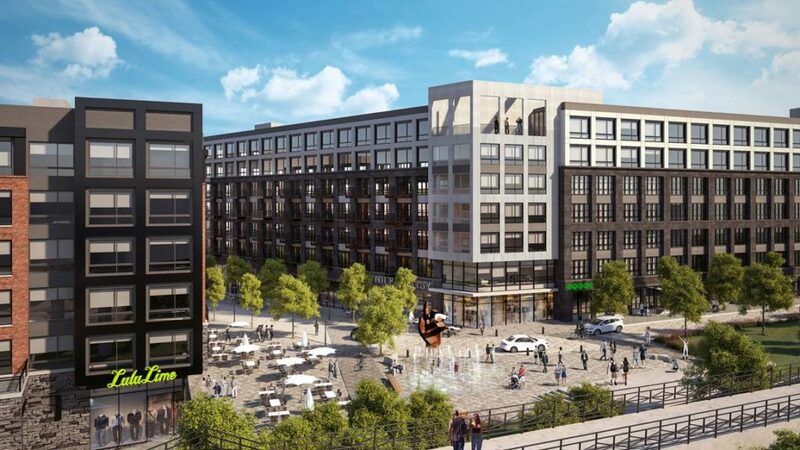 At full build-out, the overall Bryant Street project will feature over 1,650 residential units and 250,000 square feet of retail on a 13-acre site in the heart of Washington, DC, adjacent to the Red Line. Bryant Street is woven within the existing neighborhood of Edgewood and situated between the established and rapidly growing neighborhoods of Eckington and Brookland. The development will physically tie the Edgewood neighborhood back together by creating a true street grid, extending existing roads into the property and improving pedestrian access to points north and west. The central location along the Metro Red Line, Metropolitan Branch Trail and a major arterial roadway like Rhode Island Avenue allows residents multiple options for the daily commute, with Metro, vehicle/rideshare and bike access putting the District’s best amenities and employment centers within close reach. Bryant Street is easily accessible to Ivy City, Union Market, the newly opened Trader Joes and Bloomingdale’s hotspots such as Red Hen, Boundary Stone and Big Bear Café. In addition, one of DC’s hottest neighborhoods, Shaw, is less than 2 miles away. Existing retail amenities will be expanded to support the dramatic recent and forecasted population growth, including with a future grocery store, entertainment uses, neighborhood-serving retail, and full-service restaurants all adjacent to and complemented by 1.5 acres of green space and public plaza that will host temporary and seasonal events and activities. Bryant Street will be built to LEED certified standards and will boast an above average Green Area Ratio, green roofs on all buildings, and a significant improvement to stormwater management over the current shopping center.